As Organic Beauty Week draws to a close, it feels fitting to feature a product that I like to use for Sunday pampering sessions, and one that a lot of skincare fans constantly rave about. 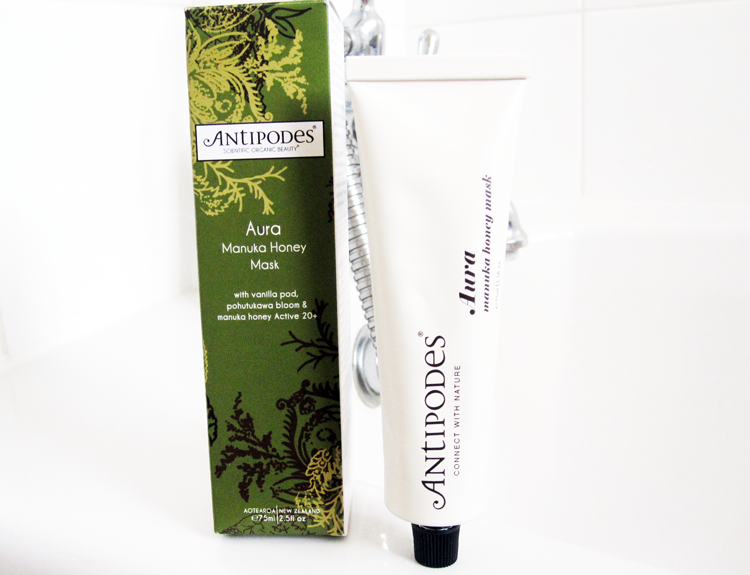 I'm talking about Antipodes' Aura Manuka Honey Mask of course, which I waited far too long to try. I finally picked it up in Wholefoods during the #FieldTripTour and I simply can't sing its praises enough. Having oily/combination skin that's also fairly sensitive is a nightmare, but this mask is its Knight in Shining Armour. Packaged in a squeezy metal tube, Antipodes' Aura Manuka Honey Mask works best if you think of it as a gentler detoxifer combined with a hydrating treatment. I'd always thought it was a deep cleanse sort of job but it's actually much more gentle than that and aims to soothe and heal blemishes and breakouts, rather than blitz them to the outer regions of the Sahara. It has a creamy texture and features nourishing oils, Vitamin E and plenty of Manuka Honey which is famed for its antibacterial and inflammatory properties. I like to slather on a generous layer and leave it on for around half an hour to sink into the skin. When the time's up, I rinse away the excess with a warm muslin cloth or flannel and my skin feels renewed, hydrated and most importantly, calmed. Any redness or inflammation from angry spots has disappeared and I notice that the next day, any blemishes are significantly reduced in size and appearance. So if your skin is prone to playing up, this is an essential face mask to have in your beauty cabinet. Have you tried this cult face mask? This sounds amazing and seems very worth that price! I've seen lots of ladies who are talking about this being a must have product! I've used a manuka honey lip balm recently but it seemed to irritate my lips, I think I need to try other products with it! Yes a lot of people love it! Ah, hope you don't have an allergy to Manuka Honey?! I've not tried this, but it sounds really lovely. Great post. Thanks for sharing the love of Aura Manuka Honey Mask. A traditional remedy of New Zealand Maori people is antibacterial manuka honey, which powerfully draws moisture to your skin to hydrate it intensely. This facial mask delivers an intensely moisturising, cleansing and antioxidising treatment. It is the ultimate solution for spots and blemishes, just leave it on overnight on the spot! I have actually never heard of it! But on reading you review, I have had a google and read some very mixed reviews! I will have to give it a go for myself!